Men: Sean Combs thinks we’re all descended from kings and we can become kings of something if we constantly believe “I AM KING! 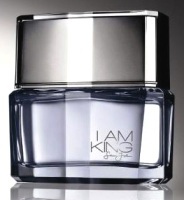 I AM KING!” (presumably while wearing I Am King cologne). I’ve thought of myself as a king since birth but, with time running out, I have no kingdom, not even a measly duchy, to call my own. But my attitude towards Combs softened somewhat when I first read the ingredients list for I Am King. Surely, even Combs cracked a smile, one hopes, at I Am King’s personally selected and quirky ingredients: cranberry, "a proprietary Imperial French berry note", premium Champagne-crème de cassis-kir royale, cooling Mediterranean water, key lime pie, and lemon cream. Other, more ordinary, notes include tangerine zest, orange, labdanum, cedarwood, vetiver, white moss (white musk? ), and sandalwood. However, after smelling I Am King, I think either Combs is trying to fool us or has been fooled himself by Estée Lauder’s perfume team of Karyn Khoury, Trudi Loren and IFF because there’s certainly no discernable champagne (sparkle), labdanum (depth), crème de cassis (liquor-y richness) or sandalwood (any real wood) in this fragrance. I Am King opens with sour citrus and a blast of sweet “berries” (nondescript, certainly not “Imperial French,” berries). As the berries buzz and bore into my nasal passages, a hazy musk appears, accompanied by mildly ozonic and lemon cheesecake notes. Then, everything becomes rather stale. Perhaps Combs gave I Am King’s creators a list of his favorite drinks and foods to include in the fragrance, and they said, “Of course! ANYTHING YOU SAY Mr. Combs!” and proceeded to concoct I Am King with a well-tried, over-tired formula of citrus-fruit/wood/musk. I Am King is not fancy or fun; if anything, it’s a mid-grade, boring sport fragrance — for young women. I hope when Sean John’s I Am Queen fragrance is released in 2009, it packs a punch — like real queens: think Maria Theresa, Divine, Latifah. Though I Am King is a commoner in the realm of perfumery, Combs is a king when it comes to marketing and self promotion; first-year sales of I Am King are expected to exceed $100 million globally. Sean John I Am King is available at Macy’s through the holidays and will go into broader general release in February of 2009; I Am King Eau de Toilette is $54-72; bath and body products are also available. Kevin: I for one am glad you're there in the trenches smelling and analyzing this merde (that's proprietary Imperial French…. well, you know) so that we don't have to. Most of the time, it's really just a commodity, isn't it? Joe: perhaps we can have a summit…I'll opt for some REAL mysore sandalwood paste and a luxurious headwrap held in place by a fist-sized emerald: maharaja! You made my morning, Kevin! Brilliant — and the perfect antidote to The King's pathetic and disturbing egotism. Robin: when you call a fragrance I AM KING it needs to deliver..HA!! Ah, Divine. So very missed! TwoPeasInAPod: no one has really taken the place of Divine have they…. those notes sound really gross. key lime pie and lemon cream? I would MUCH rather watch you prance around yelling “I am Sultan” while waving wafts of Amouage anything than listen/watch P. Diddy do anything. Short of announcing that he's retiring to a monastery. I would like to know the demographics of the people who buy his frag. though. Who are those people spending the cash to think they are “classy” (I always despised that word) by smelling like old pie? hahaha That wouldn't be any less absurd. Oy. Just when I thought SJ's ego couldn't get any bigger. Great review. This smelled like someone forgot to clean their beaker in the lab before mixing it up to me. So muddled. I think this should be called Sean John I Am NAUTIOUS! Wont be going near this one anytime soon. It's bad enough I have his other one. Yes my ehem “refined nose” sometimes goes astray. HA! krokodilgena: you know…key lime pie and lemon cream could fit into some scent portfolio/niche…the comme des garcons “Sweet” collection or something…Demeter? Hollyc: not a bad concept — use LOTS of leather (Jane Birkin purses for miles), “fine liquor” notes, chocolate from the jungles of Venezuela, 100-yr-old oud from Saudi Arabia,etc. Shall we present this to Etat LIbre d'Orange? nooo. I hate how key lime pie and lemon cream smell. They shouldn't smell at all. I want someone to put out a perfume for my cat. I Am a Pretty Kitty. LOL, I second that for sure! So sad EL usually makes nice perfumes for their celebrydudes. I had Unforgiven and it was quite nice. The ads are indeed so stupid I wonder how anyone buys a product from him, though his clothing line is good – at least for the targeted customers. Do you really think he takes himself serious?! Isn't he not just a really clever entrepreneur? I hope he sits at home, counting his bucks and laughing on the stupid people buying his stuff. I hope it – everything elde would mean he is megalomaniac (had to look this up in the dictionary, hope it is correct in this context). mybeautyblog: yes, Estee Lauder dropped the scepter on this one. As for Sean Combs' mindset…who knows! As my teen daughters say: DISS. Well, I Am Queen (as you know) so maybe I should try this. I couldn't quite bring myself to pick up the bottle as I breezed past it at Macy's. Those notes scare me. March Queen: you can wither those notes with one glance…they are NOT scary in reality. Not even close, Kevin. Nor would I want them to, in all honesty Divine truly was one-of-a-kind, and I wouldn't have her any other way. A second-place runner-up substitute for Divine would not be pleasing to me! I just got this King fragrance as a birthday gift. It is one of the worst perfumes I have ever tried The perfume name might be ‘royal’ but the perfume smells like an over ripe fruit salad. The synthetic chemical ingredient descriptions are marketing speak. Coombs might be a smart business man but he got this one badly wrong.